Our kids take Japanese language lessons. They’ve been learning the language since they were two when they started at an immersion preschool, and we’ve always had Japanese-speaking babysitters. Now our Japanese-speaking sitter is more of a tutor which is good because I don’t speak Japanese at all. My husband does speak Japanese, after ten years in Japan and another ten years of arguing with Japanese chefs in our restaurants. The teachers in the school are lovely, and the girls enjoy their classes. I’m amazed by what they are learning – my 9-year-old is already learning kanji, the complicated characters that express an entire word or concept. There are many strokes to each character and you have to do the strokes in the right order. They also learn about Japanese customs and traditions and history. It’s great. Japanese schools are big on parent participation, which is fine, except that I never know what’s going on and just stand there with uncomprehending eyes and a frozen smile while I wait for Justin to translate what’s going on. Everyone else speaks Japanese – at least the moms do (when there’s a caucasian dad who speaks Japanese he usually speaks it a lot just so that everyone knows that he speaks the lingo – show offs). Many of the kids are half-Asian, with a Japanese mother and a Canadian father, so these sessions work for them, but they don’t work for me. So I attend, reluctantly, and am constantly mystified. Yesterday’s demonstration was no exception. The topic they were expositing was “Samurai and Ninja.” Or, “Killers and Assassins” to my western mind. Totally appropriate for kids age 6-10! But Samurai and Ninja! Pretty exciting. I’m sure people were disappointed that there was no hara-kiri (ritualized suicide) demonstrations but time was limited, so. We did learn what foods samurai and ninja ate (yes to rice and fish, no to hamburgers and spaghetti). Then the kids recited Japanese tongue twisters and the adults were encouraged to also recite tongue twisters (me, frozen smile, polite refusal). I don’t know what this had to do with samurai or ninja but a lot went over my head. The climax of the demonstration was when we used black garbage bags to make ninja costumes for the kids. It’s basically an engineers’ raincoat: you cut a hole for the head and arms, cut a strip off the bottom for a belt, and you’re good. 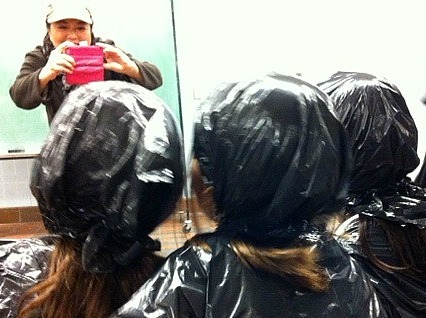 We made ninja headgear with a garbage bag cut in half and then folded into a triangle. Laid atop the head across the forehead with the point to the back, and then the sides folded against the cheeks, crossed under the chin and tied behind the neck, they were adorable. One small thing I noticed though. I’ve seen The Last Samurai and I’ve read Shogun, so I figure I pretty much know everything there is to know about ninja. I could be wrong, but ninja were quiet, right? Because you never heard so much rustling in your life. It was the sound of an army walking through dry autumn leaves. These ninja could not sneak up on a marimba band. So I’m guessing the garbage-bag costumes were not exactly authentic. But like I said, I didn’t really understand everything that was happening. I didn’t want to have the kids’ faces in here for obvious reasons. So: we learned that ninjas didn’t eat spaghetti, it’s fun to see your kid dressed as garbage, and I didn’t have to perform a Japanese tongue-twister.